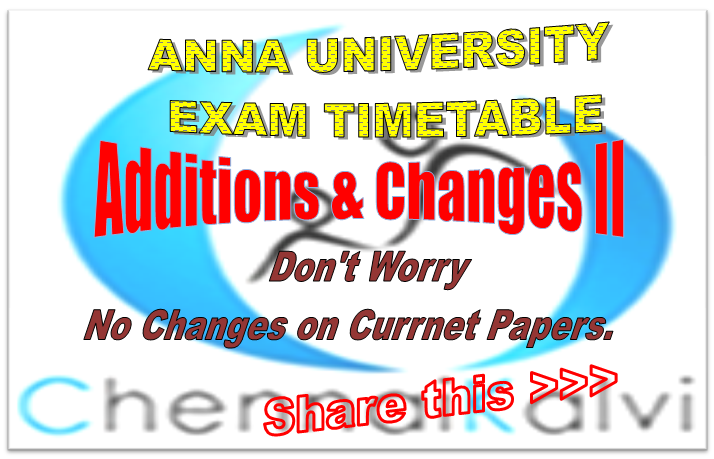 Anna University again Announces some changes on both UG and PG Exam Tables. Anyhow, this time also its nothing about to feel, Because, AU announces the Date Changes / Additions for very Few Arrear Exams Only. And there is NO CHANGES ON CURRENT PAPERS. Anna University Announces some changes on both UG and PG Exam Tables. Anyhow, its nothing about to feel, Because, AU announces the Date Changes / Additions for very Few Arrear Exams Only. Latest Update : Individual Departmentwise Timetable for Some Major Departments are Published in the following Links for the Students convenient. 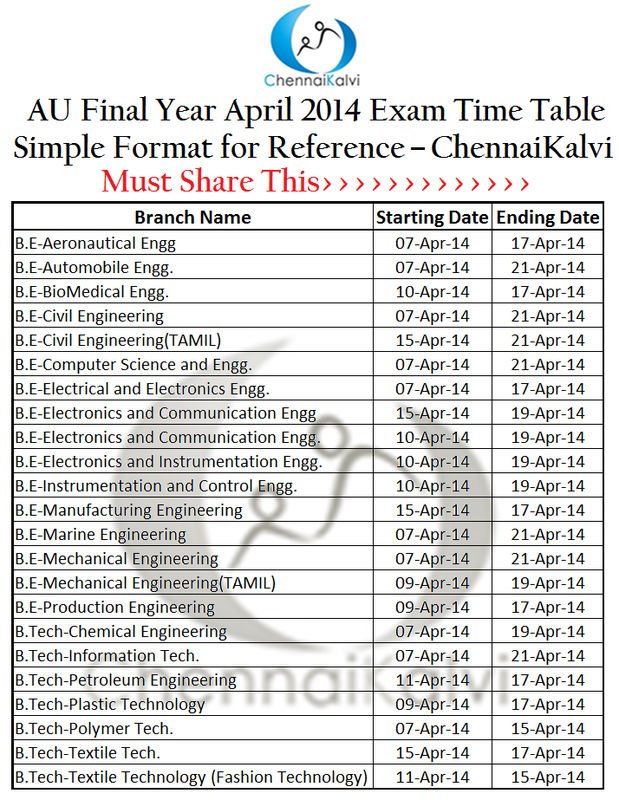 April / May / June 2014 Exam Time Table Published by Anna University. If political / media pressure increased, then Exam Time table and Review Results may be published before the elections. Already Times of India damaged the AU, about the Revaluation Procedure. Other than 8th Semester : Other than 8th Semester all semester students'Exam Timetable including arrear exams are not yet published. In our previous update, we mentioned as the timetable will be published on or before 7th April. But till now AU is not able to solve the Review Result Problem. So that, the timetable may be available only after Solving and Publishing the Review results. But, AU is still not clear about the Review result Date. Final Year 8th Semester theory exams are already started and 2nd Year, 3rd Year Practical Exams are started today. Very first time 2nd, 3rd year students are ready to move for their study holidays without knowing the exam dates. Faculties and Students are asking as "AU have to take necessary steps for solving this issues at the earliest." Is it possible to got timetable and review results before election??? Other than 8th Semester : Other than 8th Semester All other students are waiting for their Exam Schedule. 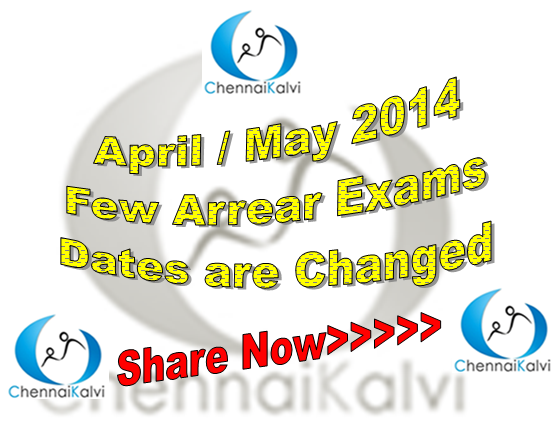 The All Semester Exam Time Tables are expected almost on 31.03.2014. CHENNAIKALVI.COM TEAM WISH YOU ALL THE BEST. Other than 8th Semester : Web Portal is Opened for Registration of Apr./May 2014 Examination (Other then 8th Semester of all regulation). Institutions are instructed to Take a Registration Preview first and Give it to the concerned student for verifying subjects. Last Date for completing the Registration Process is 04-04-2014. 8th Semester : Last Date for completing the Registration Process of (UG - B.E./B.Tech Final Semester and Passed out candidates of all regulation who have arrears in final semester) is 28-03-2014. 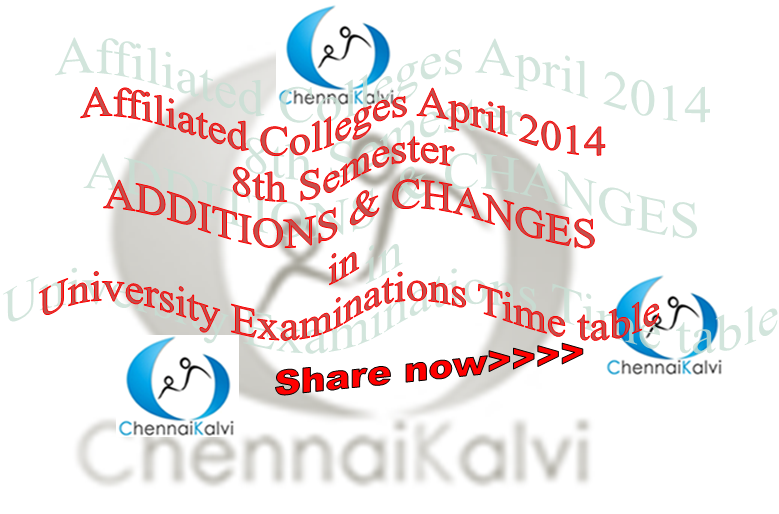 Anna University released the first Additions and Changes in 8th Semester Madurai, TIrunelveli and Trichy University Students. For Detailed information Check this Link. For All Semester Students April / May 2014 Exam Registration Process are started. And the Last Date for Registering Exam is 27.03.2014. And it is expected as the Exam Timetable will be announced very Shortly. For More Details, Please Stay tuned with us and Share our effort with your friends. Web Portal is Opened for Registration Preview of Apr./May 2014 Examination (Other then 8th Semester of all regulation). Institutions are instructed to Take a Registration Preview first and Give it to the concerned student for verifying subjects. Last Date for completing the Registration Process (Except 8th Sem) is 27-03-2014. After the server maintenance web portal 8th sem registration regenerated. Web portal 8 sem registration starts on 17 and ends 22nd of this month. 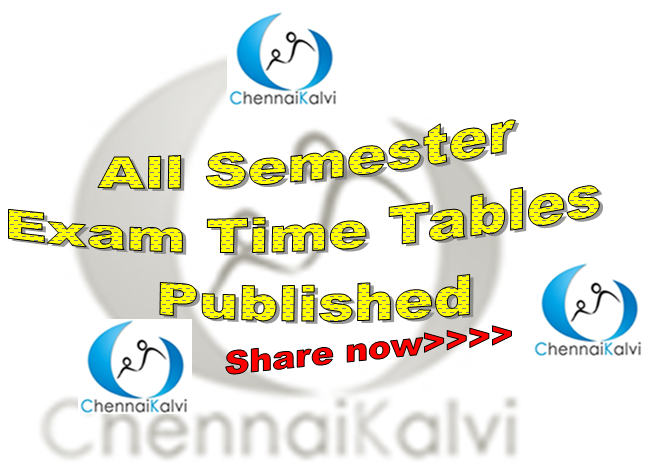 As per our Earlier news, Anna University now published the Final Year Exam Timetable. The Exact Exam Time table is expected with in 2 to 3 days. Due to Lok shaba Elections, Anna University recently announced the tentative starting dates of theory exam and Practical Exam Slots Dates. The other sem timetable may published in 2nd phase as soon as based on the revaluation progress. The period is very short. 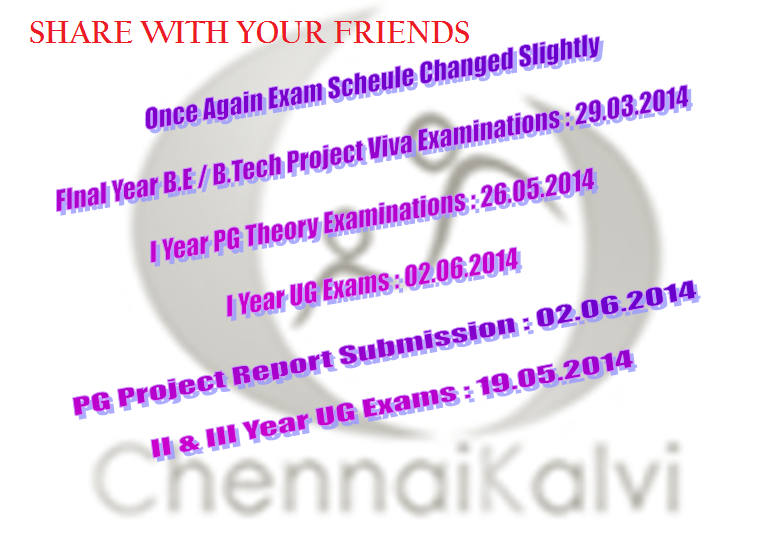 Final Year B.E /B.Tech University project as on 29/03/2014 & Theory exams as on 07/04/2014. Moreover you have a short period of 20 to 29 days to say bye from your B.E / B.Tech programme. Study well for upcoming exams. All the best for your Exams and Future. 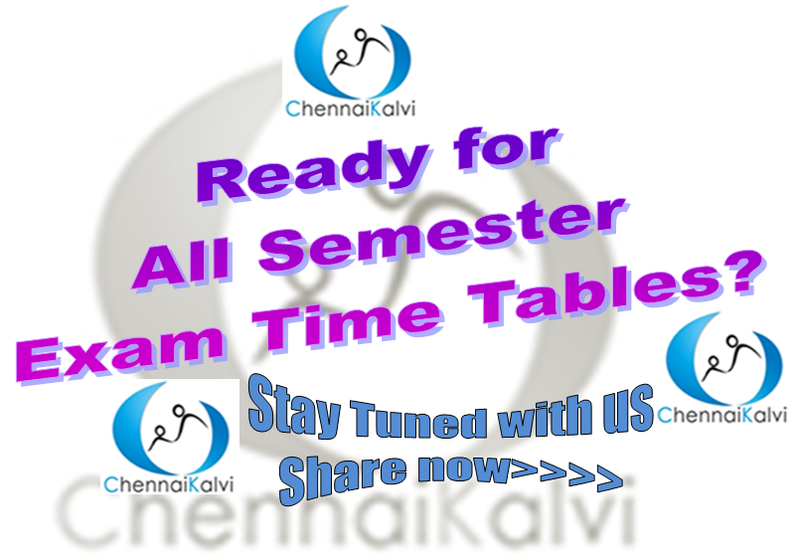 Stay tune for exam time table shortly. Official Announcement : AU-COE Once again changed the Exam Schedule for the April/May 2014 Exams. Official announcement : March 2014 Exams Hall Tickets are Generated and ready to distribute for the Trimester Students. The hall tickets are readily available in AU-COE web portal. Students can contact their college exam cell and collect your hall tickets. As per our previous update, the official announcement says, the VIII sem exams are preponed and the Last working day for B.E/B.Tech Final Semester is 04.04.2014 and the Final Sem Examinations will starts from 07.04.2014. Some of the Anna University Exams are expected to Preponed. Especially the final year (VIII Semester) Exams likely to change. Practical (Project Viva) Exams for the Final Year will be possible in THE END OF THE CURRENT (MARCH 2014) MONTH. So that, the Revaluation also will starts very soon and AU will try to release the result as soon as possible. Anna University announced the tentative exam notification for all. 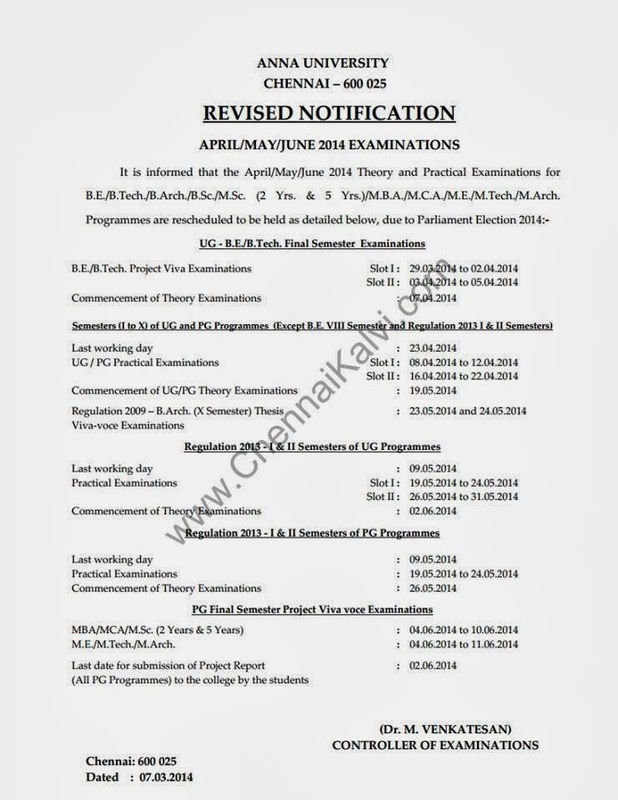 As per the notification the Final Year UG Project Viva voce starts on 03.04.2014 to 05.04.2014 for Slot 1 COlleges. Except 8th sem all higher semesters UG/PG practical exams will be held between 8th to 12th April 2014 for Slot 1 Colleges. For Slot 2 colleges 16th to 22 April 2014 will be the practical session. I year last working day is 09.05.2014. Practical schedule for first year is 21.04.2014 to 28.04.2014 for slot 1 and 29.04.2014 to 07.05.2014 for slot 2 colelges. First year theory exams will starts on 15.05.2014. 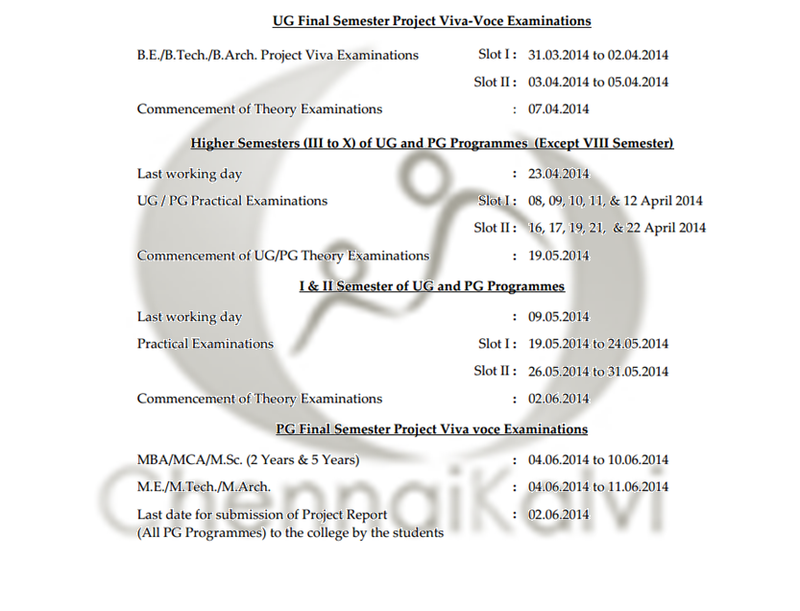 Final Year (M.E/M.TECH)PG Viva Voce will be held between 04.06.2014 to 11.06.2014. 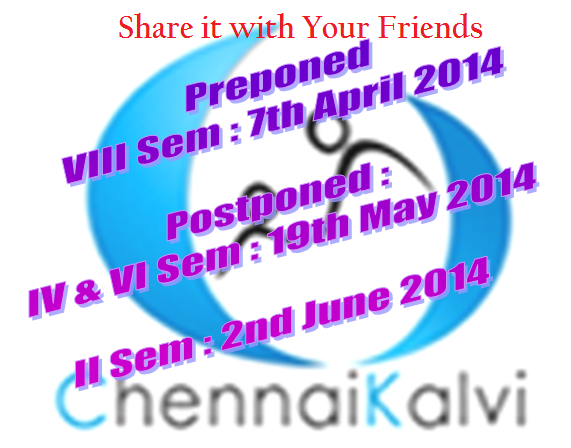 All other Final Year (MCA/MA/MSC 2 YEAR/MSC 5 YEAR)PG Viva Voce will be held between 04.06.2014 to 10.06.2014. Anna University announced the "TIME TABLE FOR M.B.A(TRIMESTER) & INTEGRATED M.B.A.(TRIMESTER) DEGREE EXAMINATIONS - MARCH/APRIL-2014 - Regulations: 2008" for candidates admitted in erstwhile Anna University of Technology, Tiruchirappalli in 2008,2009 & 2010". Its starts on 29.03.204 and ends with 03.04.2014. And also the " TIME TABLE FOR B.Tech. (Information Technology) (DUAL DEGREE) DUAL DEGREE EXAMINATIONS - MARCH/APRIL-2014 - Regulations: 2008" for all Dual Degree students admitted in erstwhile Anna University of Technology, BIT Campus-Tiruchirappalli semester dates also published. This exams are stats on 10.03.2014 and ends with 19.03.2014. The Detailed Time table is available here. For other time tables are expected soon. Anna University Even Semester Exam Notification will be available in NEXT WEEK.